Do you notice that you feel differently in the light and dark? day and night? summer and winter? That you crave different foods, have different sleeping patterns, and experience different moods? We are circadian beings, which means our ability to survive and thrive as a species depends on our connection to the rhythms of nature. We now know from the last remaining hunter-gatherer tribe, the Hadza (Hunza? ), that our gut microbes are designed to change from one season to the next. We know that microbes in the soil change seasonally and they have interdependent relationships with plants and microbes in our guts. We also know that carbohydrate-digesting microbes (Bacteroidetes) flourish in summer, when more complex carbohydrates are harvested, and fat-eating microbes (Actinobacteria) flourish in winter, when a higher fat, higher protein diet is available. Clearly, science points us in the direction of seasonal eating and routines as a primary tool to stay in circadian rhythm. Emerging studies find that digestive efficiency, in particular digestive enzymes, change with seasons. Both starch-digesting amylase and the digestion-promoting parasympathetic nervous system increases as temperatures cool in the autumn and winter. Because of the autumn harvest of starches and grains, it makes more sense that we produce more amylase. Ayurveda says that digestive strength is stronger during winter months, which would be needed to break down heavy and dense foods, such as nuts, tubers and meats. It also makes sense that the rest-and-digest parasympathetic nervous system increases during colder months, when we need warmth and a stronger digestive fire. Another difference is that receptors for neurotransmitters such as serotonin, dopamine, and brain derived neurotrophic factors (BDNF) are more receptive in the light-filled summer months and much less receptive in the darker, winter months. Which is also why we encounter more mood-related concerns and depression during winter. Nature’s biohack for this is to harvest roots in the autumn to boost BDNF, serotonin and dopamine receptor activity with herbs such as ashwagandha, bacopa and turmeric, as well as foods such as fish oils. 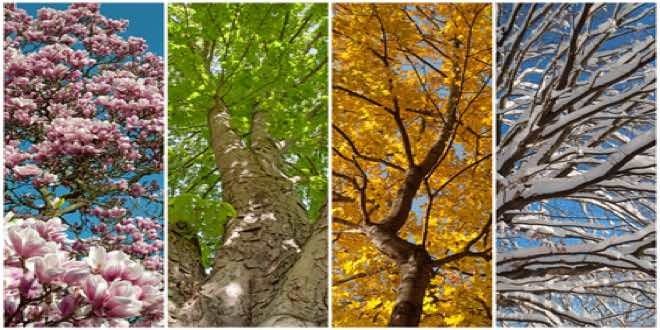 Studies in both animals and human beings have both shown increased microbial diversity in the gut during winter and spring, with much less in summer and autumn. Opportunistic harmful bacteria also increase in winter and spring, so we need our immune strength most here. Greater microbial diversity has been associated with greater health and immunity, which is much needed during cold winter and wet spring. Melatonin levels surge in winter, when daylight is less. This acts as a natural birth control agent for mammals. Conceiving in winter would render the baby premature to handle the cold the next winter. Melatonin is also the body’s most powerful immune-boosting, detox, and repair molecule, all of which we need more during darker, winter months. The loss of circadian rhythms alters our microbiome with disturbed function of gut bacteria, most notably, masking normal feeding signals, placing us at risk for obesity and type 2 diabetes. According to Ayurveda, living in sync with natural circadian rhythms is key to health and longevity. Whereas the stress of living against these natural cycles is a fundamental violation of healthy living. We are healthier with we live in accord with the normal exposure to light-dark cycles of day and night, and seasonal cycles, which does not disturb our circadian clocks. Living in sync with nature’s cycles is a powerful lifestyle tool to de-stress the body and mind and begin to enjoy life. Here is a start for what you can do towards harmonious circadian living and eating with the seasons, as nature intended. • Eat whole, organic, non-GMO, unprocessed seasonal food. Eat local and organic foods (look for foods that are grown less than 100miles away), and focus on foods that balance that particular season. Processed foods dump excess sugar into the blood stream that cannot be used right away and that is eventually stored as fat. The more processed a food, the more easily it is digested and the more rapidly sugars and fats are deposited into the blood stream – a process directly liked with obesity. We just have to feed the brain whole foods for a while and our desires and cravings for junk food will naturally dissipate. Whole grains boost the body’s metabolism for the body to digest them, yet a significant amount of calories are not digested and pass out of the body through the faeces. Research has calculated that both of these factors add up to about 100 fewer calories per day being digested and being stored as fat or unused fuel. That one meals adds up to almost 7 pounds of weight loss per year. • Eat more plants. You will gain more daily energy, experience less joint pain, have lower grocery bills and feel just lighter in general. You are also supporting a more sustainable food industry which helps the environment. • Eat mindfully, and relax when you eat. • Introduce changes in your diet slowly. Sudden changes in the diet can disrupt the elegant moulding of the rumen (layering of the stomach) community and its environment. If a deer is fed corn or leafy greens in the middle of winter, its rumen will be knocked off balance, acidity will rise uncontrollably, and gases will bloat the rumen. Indigestion of this kind can be lethal. • Get to be early. Remember, early to bed, early to rise = healthy, wealthy and wise. 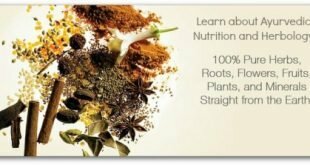 • Follow the Ayurvedic daily and seasonal clock. In nature, there are two 12-hour cycles that are each divided into three smaller cycles. Each 4-hour cycles is linked to certain bodily functions, governed by vata (wind, movement), which controls the nervous system, pitta (fire), which controls digestion and metabolism, and kapha (earth and water), which control structural strength and immunity. The first 12 hours of the day are from 6am to 6pm. During the hours of 6am -10am, Kapha increases. This is the best time for exercise and physical labour, before the sun is giving its peak heat. Kapha, being heavy, supports great physical strength. During the hours of 10am – 2pm, Pitta increases. This is the best time in the day to eat your biggest meal, as your pitta or digestive fire is the strongest in the middle of the day. During the hours of 2pm -6pm, Vata increases. This is the best time for mental and creative energy, as the nervous system is most active. Craving sweets at this time indicates exhaustion, blood sugar issues, poor digestion or that you did not each a sufficient lunch. The second 12 hours of the day are from 6pm to 6am. During the hours of 6pm -10pm, Kapha increases. This is the best time to begin settling down for sleep. Kapha is heavy, and with cortisol levels dropping at this time, you should be getting sleepy. During the hours of 10pm – 2am, Pitta increases. This is the best time to be sleeping. The liver (pitta) engages in detox at this time, (like a cleaner of floors and windows). If you are constantly up and awake during this time, the detox can be disturbed. During the hours of 2am -6am, Vata increases. The nervous system begins to stir during this time before the sun rises. This is the best time to sleep deeply and naturally wake up before the sunrise. There are three growing seasons, or harvests, from which we eat, namely spring, summer and winter. Nature is dormant during autumn, which is considered a transitional component of summer and winter. Our gut microbes are meant to change seasonally by the foods we eat. Seasonal microbes optimise digestion, mood and immunity – the way nature intended. With each seasonal shift, the microbiology of the soil changes, the chemistry of the plants change and the microbes that attach themselves to the roots, stems and leaves of each plant shift like a changing of the guard. When we eat these plants in season, we consume the nutrients in the plant as well as the microbes that are attracted to and attached to the plant. Our microbes will then also change dramatically with each season in sync with seasonal changes we make to our diet. After the equinoxes (21 March and 22 September) the earth’s tilt either takes the hemisphere you live in (northern or southern) either further away from the sun (winter), or brings it closer to the sun (summer). As the sun’s energy towards us lessens (tilting away in winter), the body responds by increasing its digestive fire. Having a stronger digestion in the winter allows us to consume harder to digest and more dense foods, such as root vegetables, some meat, grains (including gluten), nuts and seeds. Nature provides the ideal harvest for each season to keep us strong, energised and focused. We need to learn to align our desires with the foods that nature has provided in season for thousands of years. In winter, we naturally crave warm, heavy, sweet and insulating foods to stay nourished and balanced, such as soups, nuts, seeds, warm grains (oats with cinnamon) and pasta, and other high fat and protein foods, such as cheese, meat and fish and winter root vegetables. In spring we want salads, berries and leafy greens – a naturally low-fat diet. Simple ingredients make the best meals. Try a delicious green smoothie with kale, spinach, celery, parsley, coconut milk, mixed berries. Beets are full of phytonutrients and polyphenols. They act as a blood purifier and liver cleanser. In addition, they are good for activating the vital life energy, prana. Lots of organic sprouts, greens, beans and herbs in spring will keep you in balance as the flowers continue to bloom. 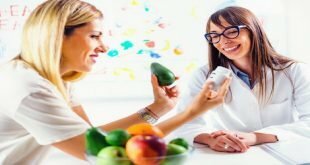 And in the summer, when the days are long and hot, we require cooling and high-energy foods such as fruits and vegetables, which are a naturally available high carbohydrate diet. Look for the summer tastes of sweet, bitter, astringent (2 out of 3 is good too) which is balancing. Prepare it to be room temperature, cool and moist. Mangoes are summer’s superfood. Cantaloupe, for instance is full of antioxidants, vitamin A, C, B-complex, beta-carotene, great for immunity, skin/hair health, eyesight, menstrual cramps, reducing inflammation, regulating blood pressure, reducing oxidative stress, digestion, detox, weight loss…and it’s over 90% water. It’s the perfect mid-summer summer fruit to rehydrate the body first thing in the morning and to keep the body cool, hydrated and replenished during summer’s long, hot days. A delicious salad consisting of cabbage, beet greens, banana peppers, chickpeas, apple, mandarin orange, herbs and dressing, cutting back on fats, just to give your body a break. Herbs such as brahmi, neem and amalaki to keep your mind cool and calm, to cleans your blood and prevent inflammation. Drink herbal teas such as mint, hibiscus, dandelion and chicory. 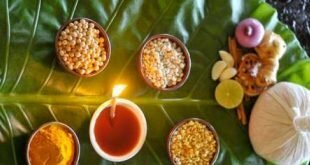 According to the Ayurveda, our bodies accumulate heat throughout the summer months, and it is crucial to help your body release that heat by the end of summer. If we hang on to heat and toxins into autumn, we can dry out the sinuses and start to suffer from allergies, colds and inflammation. 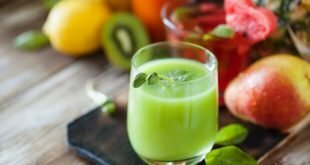 A detoxing late summer smoothie can have watermelon, cucumber, peach, fresh mint and basil. Understanding how we have lost our connection to nature is the first step in restoring optimal health. Connect your cellular clocks (we have about 100 trillion of them) with the natural ebb and flow of nature’s cycles, and you will have a life of balance and vitality.